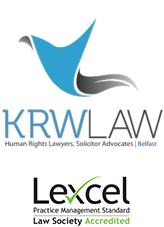 KRW LAW-LLP is one of Ireland’s leading law practices. Established in 2012, we were originally formed as Kevin R Winters & Co, Solicitors in 2001 We have offices in Belfast City Centre and have been instructed in some of the most significant and high profile cases in this jurisdiction. Providing expert advice to our clients throughout Ireland, we specialise in the areas of Advocacy, Criminal Law, Human Rights, Judicial Review, Prison Law and Civil Litigation. In addition to this we also offer a 24hr call out service providing round the clock attendance in police stations. In recent years, we have also developed a niche for criminal defence forensic analysis, and have provided advice and assistance to the Scottish lawyers of Abdelbaset Ali Mohmed Al Megrahi, the Libyan convicted for involvement in the Lockerbie Bombings, particularly in relation to the integrity of exhibit management and continuity, and also to the English lawyers of the family of Madeleine McCann, by whom we were approached to provide our opinion with regards to the validity of the now condemned forensic science of Low Copy Number DNA. Indeed, we have been cited by the world renowned guide to the legal profession, Chambers and Partners which lists the top lawyers in 175 countries, with independent rankings and editorial commentary. We are ranked in their top band, Band 1 for our expertise in public law, and criminal practice. The key to the success of their legal directories and the validity of their awards is the in-depth, unbiased research conducted by their team of highly qualified and experienced researchers. On the basis of this research, they identify the world’s top lawyers. Setting new standards in best practice we offer the highest quality of service and advice to our clients. Click here to read about us from Chambers and Partners Administrative and Public Law Section.